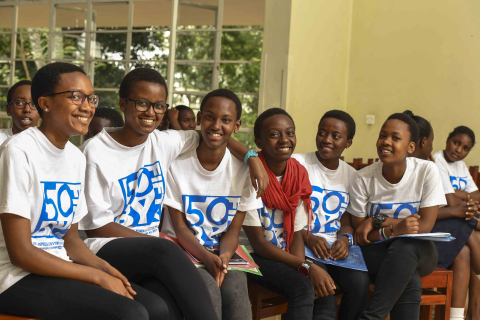 People at more than 20,000 events at schools, companies, and organizations worldwide will participate in 50/50 Day 2018 (April 26), a global day of action where participants will make pledges for moving closer to gender equality in their governments, businesses, cultures, schools, and homes. In this photo, students in Kenya participate in 50/50 Day 2017. Any school, company, or organization can receive free resources for organizing an official 50/50 Day event, including short films for screenings, discussion kits, and posters, by registering online. SAN FRANCISCO--(BUSINESS WIRE)--People at more than 20,000 events at schools, companies, and organizations worldwide will participate in 50/50 Day 2018 (April 26), a global day of action where participants will make pledges for moving closer to gender equality in their governments, businesses, cultures, schools, and homes. In the coming weeks, organizers will announce leaders from around the world who will participate in a 12-hour livestream linking all 20,000 events. 50/50 Day 2018 follows the success of last year’s inaugural day, which featured 11,000 events in over 60 countries and livestream talks with leaders like actress and advocate Eva Longoria, labor activist Dolores Huerta, LinkedIn co-founder Reid Hoffman, filmmaker Ava DuVernay, Los Angeles Mayor Eric Garcetti, and former Icelandic President Vigdís Finnbogadóttir. Building on the momentum of the Women's March, #MeToo, and Time Up, 50/50 Day will inspire citizens worldwide to make commitments aimed at shifting the imbalance of power - whether it be a CEO pledging to increase the number of women in senior roles to 50% by 2020 or a couple committing to discuss the division of household labor. “50/50 Day is such a powerful movement,” said Longoria, who participated in last year’s 50/50 Day livestream. “There are incredible initiatives happening in different industries and different fields around the world, but there's so much more we can do together. 50/50 Day connects those dots." Confirmed participants for 50/50 Day 2018 range from Twitter to Harvard Graduate Schools to the California Department of Education, which is helping to roll-out 50/50 Day throughout public schools in California. Any school, company, or organization can receive free resources for organizing a 50/50 Day event, including short films for screenings, discussion kits, and posters by officially registering a 50/50 Day event online here. Events can range from public panel discussions and company-wide meetings to school assemblies and classroom presentations. Every event will feature a screening of 50/50 Day’s flagship short film 50/50: Rethinking the Past, Present, and Future of Women + Power, the livestream with leaders in the movement, and discussions culminating with participants committing themselves to take action on reducing inequality in their personal lives via 50/50 Day Action Pledges, which will be unveiled in March 2018. The idea for 50/50 Day was sparked by Webby Awards founder and Emmy-nominated filmmaker Tiffany Shlain, who directed the 2016 film 50/50, which became even more potent after the U.S. narrowly failed to elect its first woman president. 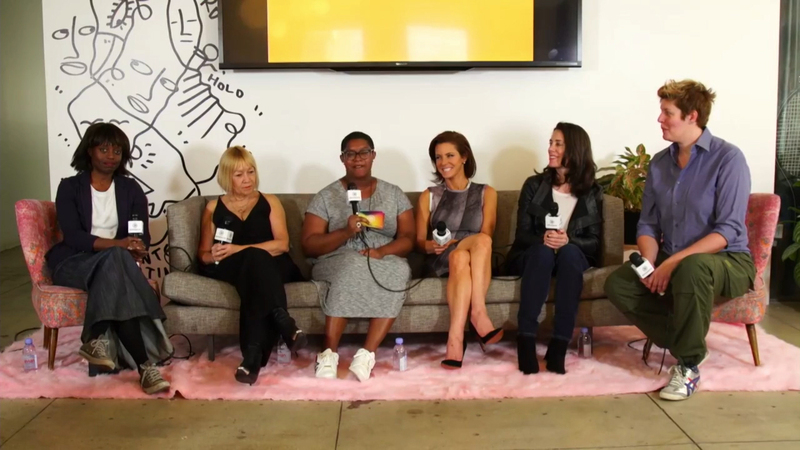 The day was co-created in partnership with activists in the field and the film co-writers Sawyer Steele, Julie Hermelin and partnership director, Makenzie Darling. Refinery29, Univision/Fusion, The Women’s Funding Network, The Jacquelyn and Gregory Zehner Foundation, David and Lura Lovell Foundation, Red Summit Productions, Ashley and Marc Merrill, Morrison Family Fund, Influence Film Club, The Fledgling Fund, Louise Davis, EACH Foundation. United State of Women, ERA Coalition, Wilson Center Women in Public Service Project, Global Fund for Women, The African American Policy Forum, A Call to Men, Take the Lead, The Eva Longoria Foundation, The Will and Jada Smith Family Foundation’s Careers in Entertainment (CIE), Time’s Up, Level Forward/Killer Content, The California Department of Education, Vision 2020, Equal Voice Canada, MAKERS, Mt. St. Mary’s University, The City of Los Angeles, MenEngage, Promundo, The Representation Project, Sarasota Military Academy, 50/50 by 2020, ICRW, Mind the Gap, American Medical Women’s Association, Vital Voices, LA Women’s March, UN’s GirlUp, BuyUp Index/Gender Fair, Draw Down Project, Panhellenic National Council, and The BoardList. On April 26th, join thousands of organizations, companies, schools, museums, libraries and homes – anywhere people already gather – in a global conversation about what it will take to get to a more gender-balanced world in all sectors of society: business, politics, culture, home, and more. 50/50 Day is based on the model of the annual Character Day, which had over 93,000 events in 125 countries and all 50 states in 2016. One of the centerpieces of 50/50 Day is the film, 50/50: Rethinking the Past, Present & Future of Women + Power, directed by Tiffany Shlain, written & produced by Tiffany Shlain, Sawyer Steele, and Julie Hermelin. Thanks to ongoing generous donations, participation is free to all. Visit www.letitripple.org/films/50-50/5050-day to learn more. Let It Ripple's mission is to use film, technology, discussion materials, and live and virtual events to engage people in conversation and action around complicated subjects that are shaping our lives, and updating these topics through an engaging, accessible, 21st-century lens. Over the past ten years, the team has created and distributed 28 films, engaged more than 50 million people in dialogue, and created a new way of making films called "cloud filmmaking," where films are made collaboratively with people from all over the world and organize global days of screening, conversation and action. Helmed by Tiffany Shlain, Emmy-nominated filmmaker, thought leader and founder of The Webby Awards, Shlain has had four films premiere at Sundance, has won more than 80 awards, and has had four of her films selected by The U.S. State Department to screen at embassies around the world to foster dialogue across borders. Find out more at http://www.letitripple.org.